Attempts to salvage a ferry which ran aground off the Blackpool coast in bad weather may take another two to three days, Liverpool coastguard has warned. Severe weather is hampering the ship's recovery and high tides which shunted it onto the sand on Thursday night will be lower over the next few days. 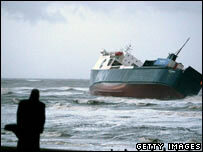 Salvage crews had hoped the high tides would help refloat the Riverdance. Twenty-three people were flown to safety after the ferry was hit by a freak wave which caused it to list. The truck ferry - owned by Seatruck Ferries - was travelling from Warrenpoint in Northern Ireland to Heysham, Lancashire, when it ran into difficulty just before 2000 GMT. Some of the ferry's cargo of 50 lorries broke chains holding them down and as the load shifted the vessel began to list at 60 degrees in conditions described as the roughest for a decade. Helicopters from the RAF, Royal Navy and Irish Coastguard battled mountainous seas and 60mph (96km/h) winds to rescue those on board. Rescuers have been hailed for their bravery by Transport Minister Tom Harris. He thanked the rescuers, including crews from the RAF, Royal Navy, and English and Irish Coastguards for saving the lives on the passengers and crew onboard. Airman Rich Taylor was winched down "swinging like a pendulum" in the gale-force 70mph winds, while below lifeboat crew raced to the scene braving 20ft waves crashing over their boats. Mr Harris said: "We always talk about hypothetical dangers some of these people have to face. "Last night was for real, these people put their lives at risk and I'm sure the 23 people on board are going to be eternally grateful for their efforts. "I pay genuine tribute to what they have done, it must have been a hair-raising operation but they did it faultlessly without injury to themselves or any passengers." Kevin Hobbs, chief executive of Seatruck Ferries, also paid tribute to the Riverdance's crew and added that a risk assessment had been carried out by the captain before the ship embarked on the crossing - which it carried out twice a day. "The crew were fantastic, they took control of the situation," he said. Although the vessel is still carrying 100 tonnes of bunker fuel for its main engine and 50 tonnes of gas oil, surveillance from a pollution-sensor aircraft has revealed no sign of leakage from the ship.